Based on the number of times I’ve seen it done badly, I assume it’s very difficult to achieve the right tone when populating your novel with life’s more downtrodden people. But with her pitch-perfect tale of people trying desperately to play the poor hands they’ve been dealt, Kelly Braffet makes it look easy. Set in a small town in the US (officially Ratchesburg, Pennsylvania but atmospherically it could be any one of a thousand similar places) it is told from the perspectives of three young people whose family histories and life experiences weigh them down in unusual ways, and almost soul destroying, ways. Patrick is in his mid-20’s and lives with his older brother while their father is in prison after having committed a crime the whole town hates him for. Verna is just starting high school where, from day one, she is bullied and abused because her Father, a fundamentalist Christian, was responsible for the sacking of a favoured teacher and her older sister Layla, once literally the poster child for her father’s religious group, has gone ‘off the rails’ rather significantly. Caro is Patrick’s brother’s girlfriend and is running from her own demons, including a genetic legacy that terrifies her. While I wouldn’t recommend SAVE YOURSELF if you’re feeling depressed already Braffet does give her tortured characters a whole lot of heart which lifts the story even when the events it depicts are crushingly sad. The opening passage in which Patrick’s father’s crime is revealed and Patrick makes an impossible choice is indicative of the way things stand in this book: bad things are going to be done and you’re going to care because the people doing them aren’t doing so lightly. It’s tearing them apart and making them look in all the wrong places for a way out. For me both Verna and Patrick were quick to get to know and to feel for even if I didn’t always like them. With Caro it took me longer to get a sense of what she was all about but when her past starts to be revealed her earlier behaviour makes sense and fits within the context of the story. On reflection I think perhaps I was just holding out – not wanting three young people to feel so sad for. Ultimately they’re all well developed and stuck in my head when I’d put the book down. Am I the only one who worries for the fictional people I’m in the midst of getting to know? Even the minor characters, such as Verna and Layla’s parents, have a very realistic feel to them and are not the one-dimensional depictions a lesser novel might make of them. For her narrative structure Braffet plays with the perspectives, sometimes offering a single view of a particular event while at other times re-telling a scene from multiple points of view. I liked the unpredictability this offered and the way it stopped me from ever thinking “I’m dead certain what’s going on here”. Of course I shouldn’t presume to know what’s in an author’s mind but I have an idea that was one of the themes she was exploring: that rarely is there a definitive account of any of life’s major (or not so major) events. About the only thing that surprises me about the hype around this book is its marketing as any kind of thriller. It certainly doesn’t come within cooee of my definition of that word and I’m not even convinced it’s a broader crime novel but such labels should be irrelevant. 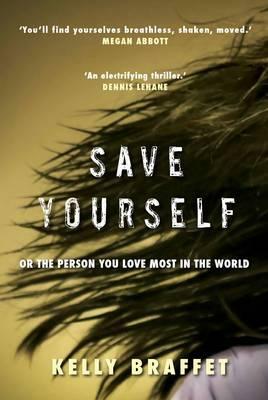 SAVE YOURSELF is a bloody good read whatever shelf of the bookshop it belongs to. This is the third book I’m including as part of my participation in the Reading USA Fiction Challenge which requires me to read a book set in each state and I have added the twist that all the books are by new to me authors. This one crosses Pennsylvania off my list. This entry was posted in book review, Kelly Braffet, USA and tagged Reading USA Fiction. Bookmark the permalink. Bernadette – I’ve been reading some very good things about this one. I’m glad to know it wasn’t all hype and that this one is well worth the read. And I can just imagine the kind of small town these people live in. Dozens of them where I grew up and later went to uni. I thought this was very well written, but so depressing. And yes, not a thriller at all. I find the category “thriller” most perplexing. It’s straight fiction to me. Hmm….despite your enthusiasm I’m probably undecided on this one. I’ll sit on the fence for now and see how the stacks are if and when I cross paths with it. Hadn’t heard of it before your post or seen it blogged about elsewhere….kind of under the radar. Like Col, I had never heard of author or book. It sounds interesting, but only for when I’m feeling strong.